It has been far too long since I reported on the exponential growth of our profession. When I launched the Roll Call in early 2013, our community was already larger than anyone knew. We thought there were less than 50; turns out, there were nearly 100. 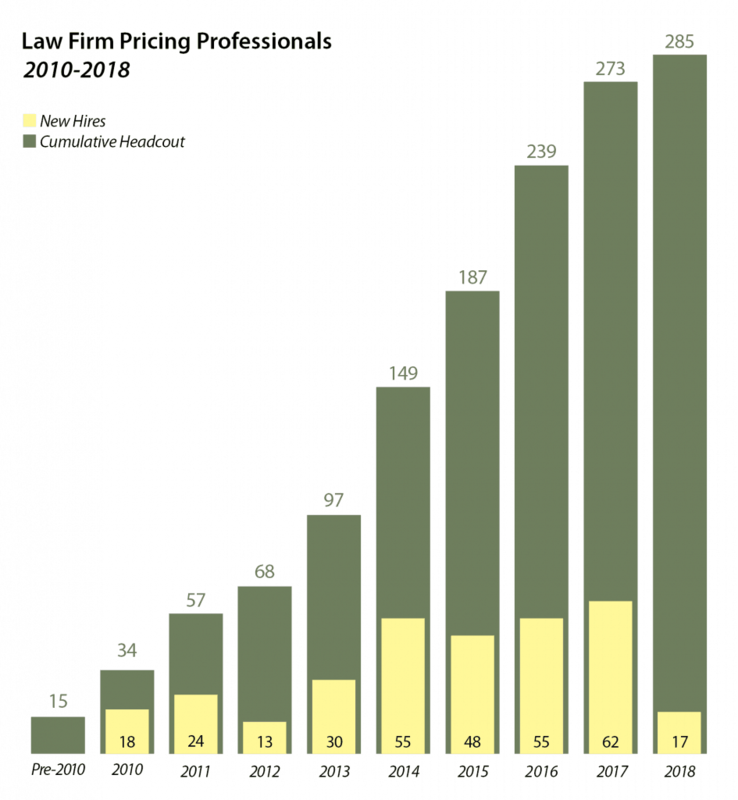 Five years later, the growth has nearly tripled, though slowing down: as of December 31, 2018, I am aware of 285 current professionals in law firm pricing positions. Significantly, the growth in the last four years eclipses the prior four years by more than double. From 2010 to 2013, a total of 85 pricing professionals were hired. From 2014 to 2017, an amazing 220 pricing professionals were added to the legal industry. This does not include the 70 incumbents that received promotions or changed law firms during the same time period. The growth of the C-Suite is a noteworthy highlight. Since 2014, when Greenberg Traurig created the industry’s first Chief Pricing Officer, only six firms followed with a comparable C-Suite position by 2017: Bryan Cave, Covington & Burling, Orrick, Robins Kaplan, Simpson Thacher, Steptoe & Johnson. In one year — 2018 — the C-Suite Club nearly doubled, adding the largest single-year class ever, with five firms adding a C-Suite pricing position: Ballard Spahr, Bergman Singerman, Goulston & Storrs, Pepper Hamilton, Shearman & Sterling. A more detailed look is HERE.